You might already love crepes as a dessert or even as a breakfast treat, but have you ever tried them as part of your entrée? Once you serve this delicious stacked crepe casserole to your family, with its creamy goodness and cheesy topping, you may wonder why you never incorporated crepes into your main dish earlier. 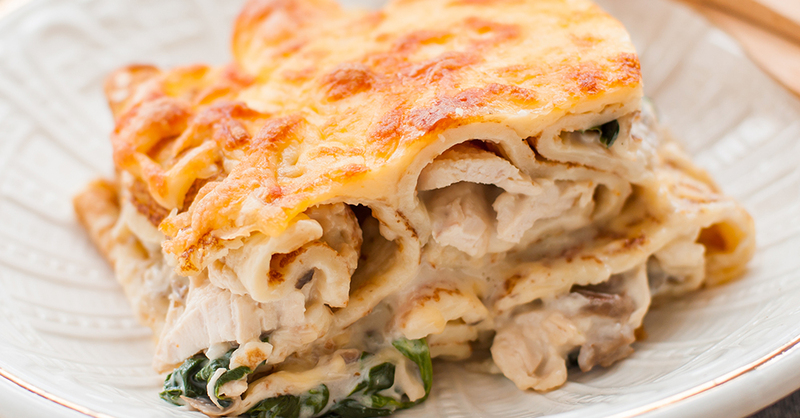 The savory combination of chicken, mushrooms and spinach join together to create a new taste treat to add to your dinnertime rotation when you find yourself in a rut. Take our word for it and try this bad boy out…you won’t be disappointed! Preheat oven to 350º F and lightly grease a 9x13-inch baking dish. In a large bowl, mix together flour and eggs. Slowly add in milk, and stir together. Mix melted butter into batter mixture. Heat 1/2 tablespoon olive oil in a crepe pan or small, shallow frying pan over medium heat. Drizzle in 1/4-1/3 cup crepe batter until bottom of pan is just covered. Cook crepe until edges start to pull away from the pan. Use a rubber spatula to flip crepe, and cook for another 20-30 seconds on the other side, or until golden. Remove finished crepe, then repeat until there's no remaining batter. Heat remaining oil in a large pan or skillet. Cook mushrooms until tender, about 5 minutes, then add spinach, stirring for 2 minutes, or until wilted. In a large bowl, mix together chicken, cream of mushroom soup, 1/2 cup cheddar cheese, sour cream and mayonnaise until combined. Fold in mushrooms and spinach. Layer 2 crepes in the bottom of casserole dish and top with 1/2 cup chicken mushroom mixture. Repeat layers until all crepes and all of the chicken mixture are used up, ending with a layer of crepes. Sprinkle remaining 1/2 cup cheddar cheese over crepe mixture. Place baking dish in oven and bake for 20 minutes or until cheese is bubbly.